Honeywell Molded Plastic Fire Hanging File Chest. Convenient Rails accommodate standard hanging files. UL Fire rated for 1/2 Hour Fire Protection and 24 hours of waterproof protection due to 2 Compression latches. Comes with two Keys and the industries best. 26-inch 5-Drawer Tool Chest This black 5-Drawer tool chest is made from high grade all welded steel construction and finished with tough black industrial powder coat paint. 2 small and 3 large drawer are ideal for a wide array of items. All drawers feature 50 lb. rated ball bearing drawer slides. All drawers have extra-large full width aluminum drawer pulls for easy access. The cabinet drawers are secured by a keyed internal locking system and come with 2 keys. 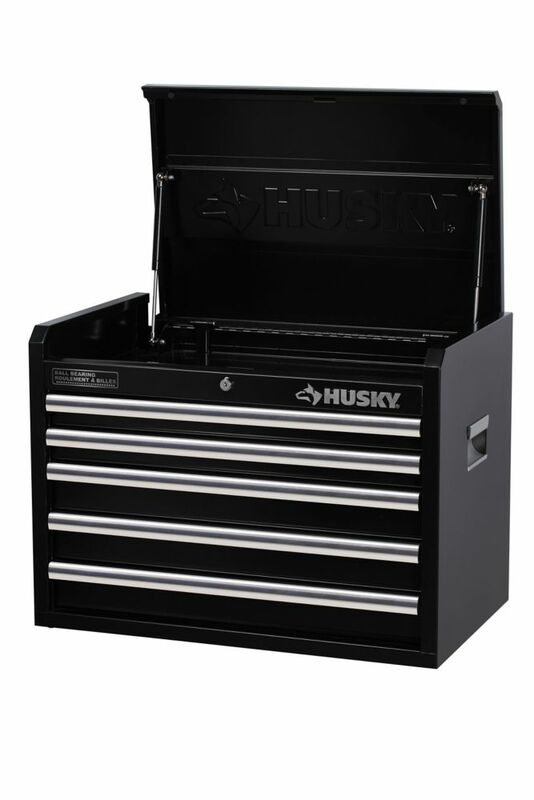 26-inch 5-Drawer Tool Chest is rated 3.5 out of 5 by 2. Rated 2 out of 5 by Home user from Already scratched when new The chest quality overall is good. But on the side where the cover close the paint was chipped on both side. I decided to keep it, because this thing weight 71 pounds. But be aware the even new, you will already have paint chip on your product. Rated 5 out of 5 by CraigB from Great product for the price I have one of these and just ordered another along with the matching bottom cabinets. They are not a professional quality cabinet but they are certainly great for the home garage. I've used it well for a couple years and have no real complaints so far. Drawers are quite smooth loaded with heavy tools. For the price, these can't be beat. Height would be roughly 37 inches with lid open.